Herbs typically bring to mind seasonings to make foods taste better or home remedies to heal what ails you. 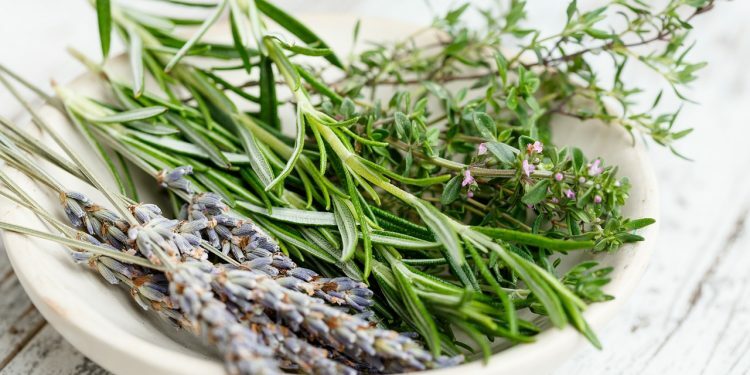 Few people associate herbs with the sensational dried leaves of potpourri or the sweet aromas drifting up their nostrils on a walk through a garden. Oils found in aromatic herbs make them popular in cooking. The same oil that the recipe calls for can fill your house with luscious scents. Even herbs that may never see the kitchen can reward a nearby nose. Lavender, a Mediterranean native herb, is a beautiful herb with small purple blossoms and has an amazing aroma. It attracts Black Swallowtail butterflies and humans alike. Its fragrance is perfect when used in perfumed sachets. Sage produces an amazing aroma when the leaves of the plant are rubbed between the thumb and forefinger. The senses will be delighted by its dynamic fragrance. Sage is a member of the mint family and originated in Asia Minor. Fortunately, it can be grown all over the world making it a perfect addition to any herb garden. Another wonderful addition to the garden would be caraway-scented thyme. The spicy fragrance is a favorite among herbalists, and this eye-catching bush will also attract butterflies and bees. Early summer will bring pink blossoms from this herb, which is in the mint family. Sweet Marjoram another one of the aromatic herbs from the mint family has been used for centuries. It is frequently an ingredient in perfumed soaps, but many people enjoy its spicy scent ground up in potpourri. Don’t confuse it with Origanum Vulgare, its wild cousin also known as Oregano. It is simple to preserve herbs. Fresh sprigs will keep well for about one week when placed in a jar of water (like a bouquet) and refrigerated. They also can be stored in preserving oil for 8 to 12 weeks. Rinse the herbs and allow them to dry for about 60 minutes, then place them in a container and cover with the oil. If you want to store them for longer, it is a good option to keep them in the freezer. After washing, remove the water and then store in a plastic bag in the freezer. Another way is to chop them and keep the pieces in the ice cube tray. Unexposed to air they will retain the freshness for more than 4 months. For longer storage keep them in a jar of vinegar after cleaning and drying. Flowers hung to dry in a cool, dark place are great for making potpourri; just remember that the spices and aromas of potpourri come from the oils in the petals and they will evaporate after a while. Though that is ideal for a potpouri jar or satchet bag, in order to extend the life of the herbs other methods are necessary. One way to accomplish this is to use an airtight bag. These bags prohibit oil from escaping the plants and prolong their life. Of the aromatic herbs, marjoram, thyme, mint and sage all keep their aroma very well when they are dried. When done correctly, they will give off a pleasant scent for weeks.